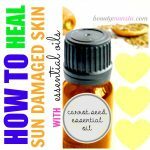 7 Soothing Essential Oils for Razor Burn Relief - beautymunsta - free natural beauty hacks and more! Got razor burn? 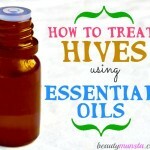 Apply soothing and cooling essential oils for instant relief! 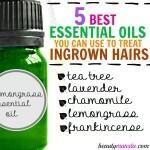 Check out the 7 best essential oils for razor burn below! Razor burn is a common occurrence for people who shave their facial and body hair. They happen when you use a blunt blade or improper shaving technique. Razor burn is characterized by inflamed & red skin, usually accompanied by rashes, bumps and blisters that itch, hurt & burn. Exfoliate before shaving. You must exfoliate before shaving to prevent razor burn, bumps, ingrown hairs, clogged pores and skin irritation. Make your own exfoliating scrub for razor burn by combining 1 cup of sugar (preferably brown sugar), ½ cup of olive oil, 5 drops of lavender, 5 drops of geranium and 5 drops of german chamomile in a ball mason jar. Scrub a little of this mixture onto your skin to slough off dead cells, dirt and other impurities before you shave. Use a sharp razor. Razor burn is mostly caused by using dull razors. Use a sharp razor lightly on your skin for a smooth and effective shave. Make sure to clean your razor after shaving by dipping it in alcohol and rinsing in cold water. Shave immediately after a shower. Showering softens the skin, removes any dead cells and grime and cleanses the pores which makes it easier to shave without hurting the skin and causing razor bumps, burn and ingrown hairs. Cooling Compress. After shaving, press a cooling compress onto your skin to soothe inflamed and irritated skin. Make a compress by soaking a washcloth in cold water. Wring and apply on skin. Moisturizing & cooling aftershave. Applying a cooling aftershave immediately after shaving provides soothing relief to freshly shaven skin. 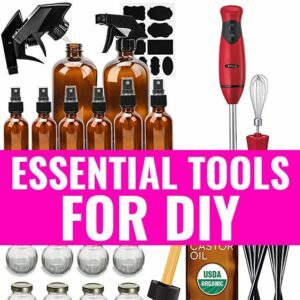 Here’s how to make your own: Add 4 oz coconut oil, 2 tsp grapeseed oil, 10-12 drops peppermint, 5 drops of lavender and 7 drops of tea tree in an electric stand mixture. Beat until you get a white fluffy mixture. Slather all over your skin after shaving to cool and soothe. 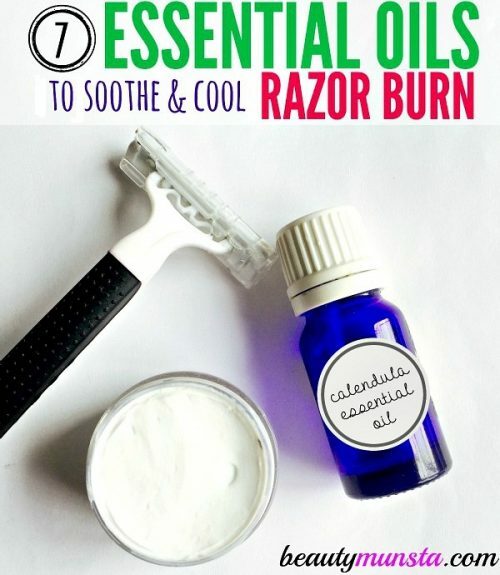 Soothe & Cool: 7 Essential Oils for Razor Burn Relief! Lavender essential oil is no doubt the most versatile essential oil on the planet. It’s got anti-inflammatory, antiseptic, antibacterial, astringent, cleansing and moisturizing properties that make it one of the best essential oils for razor burn. You can apply lavender essential oil ‘neat’ onto your skin: just rub a few drops between your palms and apply to freshly shaven legs to prevent razor burn. Both roman and german chamomile are good essential oils for razor burn but german chamomile is more effective out of the two. 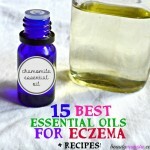 It gently soothes and calms irritates, inflamed and burning skin. Mix a few drops in coconut oil and gently apply to freshly shaven skin. Frankincense essential oil is one of the best essential oils for razor burn and ingrown hairs. It has skin soothing properties that help calm inflamed skin and its antiseptic properties fight off germs that can cause ingrown hairs. Just like lavender, frankincense can be applied ‘neat’ onto your skin. Calendula essential oil is extracted from calendula flowers and is known for its powerful antiseptic and skin soothing properties. It helps calm painful, burning and irritated razor burn. Mix 4-8 drops in 3oz carrier oil like fractionated coconut oil and apply onto your razor burn to heal. Due to its high menthol content, peppermint essential oil provides a cooling relief to razor burn. It helps numb the pain and soothe the burn. Mix 3 drops of peppermint in filtered water and store in a 2 oz spray bottle. Spritz on skin to cool down razor burn. Geranium essential oil has a cleansing and balancing effect on the skin. It nourishes dehydrated and dull skin and also soothes aggravated skin, making it one of the best essential oils for razor burn. Dilute 5 drops in 2 oz of avocado oil and gently smooth onto your razor burn to provide relief. What makes tea tree one of the best essential oils for razor burn is its antiseptic, disinfectant, cleaning and soothing properties. Applying it keeps the skin free of germs that can aggravate it further. Mix just 7 drops in 4 oz of jojoba oil and massage a little over your razor burn. Before applying the essential oil on your skin, first use a test patch on your inner wrist or elbow to see if it is safe for your skin. If you are pregnant or nursing, first consult your doctor and would like to use essential oils for razor burn, please consult your doctor first, as most essential oils are not safe for pregnant or nursing women. People suffering from asthma, hypertension and other severe or chronic illnesses must also consult professional medical practitioners before using essential oils. 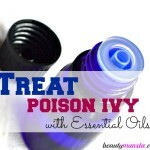 Keep essential oils away from children and pets as they are very potent and can be toxic.